Dr Who and film fabric! The fabric features the Doctor’s arch enemy, the Daleks! I had a list of things in my head that I wanted to use this delightful fabric for and in the end I decided on a drawstring bag and a document wallet. It was such fun sewing with this fabric. I loved it! There seems to be a rise in popularity in film or tv fabrics. I recently purchased some fat quarters from Hobbycraft, themed with both Jungle Book and Toy Story. I have used the Jungle Book fabric to make some bunting, which sold a few days later. The Toy Story fabric is currently in the process of being made into bunting again! Mickey Mouse and friends have also featured in my Etsy shop I’ve had great fun making purses, wallets and bunting from a great array of fabric. Just last week, I saw a fabulous Tom and Jerry fabric too. It’s on my radar to buy although I have so many fabrics! It’s just hard to resist. Watch this space! For all the latest makes and designs, click on my Etsy shop button! As a child of the 1970’s loved the Clangers, my favourite character was the Soup Dragon. It sounded such a brilliant name for a dragon to have. To my surprise my young son loved the Clangers too (we bought him all our childhood DVD’s) so imagine the excitement when CBeebies decided to bring the series back in an updated format. Now he is Clangers mad! For his birthday a couple of weeks ago my mother in law knitted him a clanger. Despite all the expensive lego this present is by far the favourite. 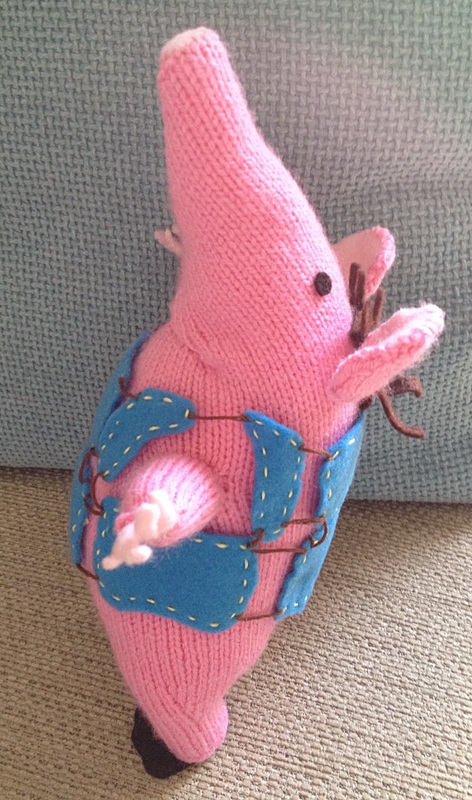 I thought I might have a go at making a companion Clanger for him and searched for a suitable pattern although knitting is not my strong point! Have fun with the pattern! I'm a full-time mum from Birmingham sewing handmade pretty, retro and vintage goods. I am obsessed by the 1950's and anything pink! You can see what I have for sale on Etsy, or follow Lizzy's Homemade on instagram.